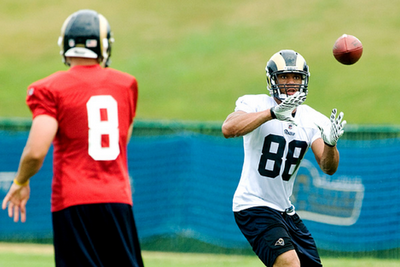 Rookie tight end Lance Kendricks is making an early impression on quarterback Sam Bradford. The St. Louis Rams are far enough along in training camp to visualize how quarterback Sam Bradford and some of his new weapons might mesh in the future. They're still too early in the process to claim a strong rapport has developed. There are first impressions, however, and rookie tight end Lance Kendricks is making a favorable one. "Lance has done some great things," Bradford told reporters in St. Louis. "He has been asked to do a lot as well. I think he’s probably taken more reps than anyone else on our offense." That last part could be telling. The Rams envision moving Kendricks, a second-round pick, around the formation and keeping him on the field. "It seems like that every time I look out there, he’s in there," Bradford said. "Whether he is at 'Y', he’s at 'F', he’s playing wide receiver some. I think he’s done a great job, he’s physical. He really stood out to me yesterday when we put the pads on and we had the 'Ram Drill'." Turn your playbooks to the index for a little review session. The "Y" spot is where traditional tight ends line up. The "F" spot refers more to the slot and allows for more motion/movement. As for the Ram Drill? It's a version of the Oklahoma Drill featuring one-on-one battles between blockers and tacklers. "(Kendricks) was in my line and the first time he went, he absolutely destroyed his defender," Bradford said. "I think two guys later, we were looking for someone on offense and he came running back up to get some more. It's things like that, that really turn you on to a guy like that."